Here you can find the broadcastschedule of the programs produced by our international partners. These are programs that is aired worldwide by Norea Radio Danmarks partners (Trans World Radio - Europe, Evangeliums-Rundfunk, Norea Radio Sweden, Norea Norway ...... around 30 partners al together in Europe, even more outside Europe). Further more you are able to find a complete overview of the programs produced by Trans World Radio - Europe, and its over 30 partners in Europe, Middle East and North Africa right here: interactive map (you will need a upgraded Flash Player to access this site). Alternativ you can find your favorite language through the "Partner list". 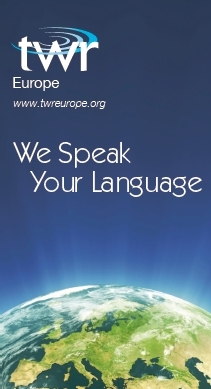 Trans World Radio - Europe and the partners is covering Christian programs broadcasted in Europe, Northern Africa, Middle East and a part of Asia. Some of the programs are broadcasted through satellites and/or shortwave and middle wave and a lot of them you will also find on the internet - and quite a number of them you are able to hear in Denmark. Briefly about the reception of weak radio signals: General "launge radios" are often very bad in reception, unless they are connected to an external antenna or single antenna installation. You often achieve the best reception conditions with a transistor radio - especially when we talk about short-and medium-wave signals. Today a large part radio receiver are sold without the opportunity to receive short-and medium-wave signals.